Jay DeMerit has one of the most unique success stories soccer has ever seen. Undrafted in the MLS, Jay backpacked to Europe, slept on attic floors and climbed the English soccer pyramid from the 12th tier to become the captain of Watford FC in the English Premier League. He also represented the US Men’s National Team, playing every minute of his team’s games throughout the 2010 World Cup in South Africa. In 2011, he signed on to became the Whitecaps FC’s inaugural MLS captain, a position he held until retirement in 2014. Off the field, Jay has taken the stage at Tedx Vancouver, spoken at national conferences, and was the keynote speaker on “Grit” at the US Soccer Federation’s annual symposium. 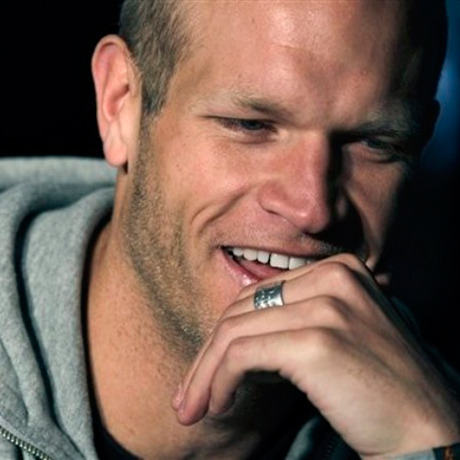 His story was the subject of “Rise & Shine: The Jay DeMerit Story,” a documentary released in 2011 after a successful Kickstarter campaign where the soccer community raised $223,000 to turn this story into a feature film. Based on the ideals portrayed throughout the film, Jay and his wife, Olympic Gold Medalist skier Ashleigh McIvor, started the Rise & Shine Foundation and Captain Camps, which provides a 4-day leadership program for kids ages 13-18. Jay also has a degree in Industrial Design, which he put to use founding Portmanteau Stereo Co., which repurposes old suitcases and BC wood as portable Bluetooth speakers and home audio systems. I think creativity comes from a curiosity, a willingness to look at a situation, a need, or product and wonder why it is that way, and what can be done to make it better. Be it in my sporting in life or by earning a degree in product design, both have taught me this process. I find energy in people. The human connections that make us all unique, and trying to be a part of the social needs that connect us. Creativity is what is required to remain amongst those environments, I like to be right in the middle of that. I think in any walk of life, the true foundation of how to achieve human successes are to drive from your truest self. Get to know yourself as soon as you can, by experiencing everything you can. The earlier you start to define what drives your human spirit and creative energy, the sooner you will find your successes. Muhammad Ali or Salvador Dali. I had a corneal transplant surgery in my eye, 6 months before I played in the World Cup. When I was at University (17 years ago! ), my professor made every one of us in class subscribe to Wired Magazine. It stays on the cusp of technology & design and gives us a real gateway to the future. It’s still the only magazine I buy when I’m at an airport.